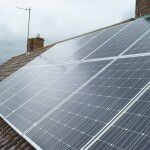 We’d just like to say thanks for the excellent job you did for us [solar PV installation in Huntingdonshire]. You answered all our questions and concerns, installed our solar panels in a tidy (and safe!) manner, and left us with an excellent handover pack. Our new solar panels are the talk of the neighbourhood and we look forward to receiving our first income cheque from them!